Allied war crimes during World War II: Allied war crimes include both alleged and legally proven violations of the laws of war by the Allies of World War II against either civilians or military personnel of the Axis powers. At the end of World War II, many trials of Axis war criminals took place, most famously the Nuremberg Trials and Tokyo Trials. Allied-occupied Germany: Upon defeat of Nazi Germany in World War II, the victorious Allies asserted joint authority and sovereignty over 'Germany as a whole', defined as all territories of the former German Reich west of the Oder–Neisse line, having declared the destruction of Nazi Germany at the death of Adolf Hitler . The four powers divided 'Germany as a whole' into four occupation zones for administrative purposes, under the United States, United Kingdom, France and the Soviet Union respectively; creating what became collectively known as Allied-occupied Germany (German: Alliierten-besetztes Deutschland). 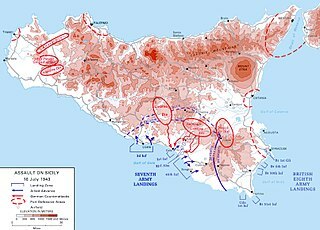 Allied invasion of Sicily: The Allied invasion of Sicily, codenamed Operation Husky, was a major campaign of World War II, in which the Allies took the island of Sicily from the Axis powers . It began with a large amphibious and airborne operation, followed by a six-week land campaign, and initiated the Italian Campaign. Allied intervention in the Russian Civil War: Allied intervention in the Russian Civil War consisted of a series of multi-national military expeditions in 1918. The stated goals were to help the Czechoslovak Legion, to secure supplies of munitions and armaments in Russian ports, and to re-establish the Eastern Front. Allied invasion of Italy: The Allied invasion of Italy was the Allied amphibious landing on mainland Italy that took place on 3 September 1943 during the early stages of the Italian Campaign of World War II. The operation was undertaken by General Sir Harold Alexander's 15th Army Group and followed the successful invasion of Sicily. The main invasion force landed around Salerno on 9 September on the western coast in Operation Avalanche, while two supporting operations took place in Calabria (Operation Baytown) and Taranto (Operation Slapstick).